Introducing the WITI Platinum BusinessCard - designed to help you build and grow your career and business. WITI is pleased to announce the participation of many amazing women and dynamic speakers at our National Conference event. Visit our website for speaker information and attendee testimonials. Register today! We just returned from a family vacation that was several weeks long. Register today to see Mellanie at WITI's National Conference on June 8 & 9, where she will be speaking on "Designing the Plan for Your Life and Health". Discuss this article! Do you have an up-to-date résumé? Hardly a week goes by that I don't receive a call from someone asking if I could write their résumé, TODAY!!! An opportunity has been presented to them and they've been asked to provide their résumé ASAP. Since I require my clients to provide me with salient information regarding their past accomplishments, achievements and value-added contributions in previous positions as well as identifying their core marketable talents, they are rarely prepared to provide me immediately with the information I need to write an interview-clinching résumé. More information is on our website. Starting at $49 for WITI Members, you can't afford not to attend! Register now! Julie B. Ross recently joined Atlantic Associates, Inc., a full service information technology temporary-to-permanent staffing solution company in West Roxbury, Massachusetts as the Director of Operations/Legal Counsel. Atlantic's CEO John Fitzgerald has seen unprecedented growth in his firm since first opening in 1998. "We are in a very fortunate position to be doing so well in spite of so many companies sending their IT work overseas," says Fitzgerald. "By hiring Julie, we're making a major commitment to our operations department while bringing our legal counsel in-house". Ms. Ross brings her extensive knowledge of computer operations and technology to her new position with Atlantic. Previously, she has served as a prosecutor specializing in computer and white-collar crime with both the Suffolk County District Attorney's Office and the Attorney General's Office. As lead legal counsel for Atlantic, she is building a training program that will mirror her efforts at the Attorney General's Office, working to create proactive systems that will protect a company from potential computer crimes. Ross' father is Steve Ross, the founder of the New England Holocaust Memorial. As a daughter of a holocaust survivor, Ross is the President of Generations After, a non-profit organization whose mission is to preserve the legacy of holocaust survivors. Generations After is a now involved in a pilot program with the Jewish Family and Children's Services. - People who want to create and live a life of their own design versus living life by "default"
Jane offers a complementary 30-minute telephone coaching session so that you can experience the power of coaching first-hand. 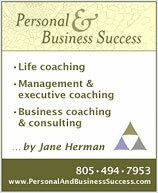 For more information, visit Jane at www.PersonalAndBusinessSuccess.com. SPECIAL OFFER FOR WITI MEMBERS: Just give your WITI membership number and you will receive a $50.00 discount on your first month of coaching! June 8 and 9, 2004, WITI will host a Silent Auction during its 2004 National Conference in Silicon Valley. Proceeds from the Silent Auction will benefit The Women's Alliance, a national organization of independent community-based members who provide professional attire, career skills training and related services to low-income women seeking employment. Each year, The Women's Alliance members help more than 30,000 women in transition from poverty, welfare, and other dire circumstances. With your donation of a Silent Auction item, The Women's Alliance can continue to help low-income women in your community prepare for and succeed in the workplace. For more information contact Nicole Wild at 305-762-6400 or email: [email protected]. Meet your readers at our "Books That Empower Women" expo at WITI's National Conference. If you'd like your book included or if you are interested in scheduling a book signing, then complete our Author's Participation Form and tell us how your book inspires and empowers women. Interested in being tapped for corporate board service? Then you need to know about the Boardroom Bound® 2004 Pipeline Seminar, coming to Washington, DC June 21-22 and September 28-29. Don't miss this opportunity to create a Corporate Appointment Strategic Plan and take your next steps toward the Boardroom! "Thanks to Boardroom Bound, I know what steps to take that will lead me into the corporate boardroom." (Tracy Bousky, CPA, Chicago.) Attendance is limited to 20, and registration is on a first-come-first serve basis. Register today! Whatever their issues -- global networking, system design and optimization, security, doing more with smaller budgets, and more -- conference attendees find the latest thinking and practical advice at Gartner Events. Attendees are decision-makers looking for perspective, analysis, and impartial advice. They include senior IT and business executives from virtually all major categories of commerce and industry. Many are CIOs or senior business strategists. Most are responsible for IT budgets and technology/ business strategy. WITI members receive a minimum $200 discount off Gartner's standard pricing for seminars and conferences; visit the Conference Discounts page in the WITI Members Area for the promo code. Visit Gartner for details on conferences and seminars. Risk Analysis Group, the leader in traditional seminars on Integrated Risk Management, brings break-though knowledge right to your office. Webinars offer a real-time visual presentation on your computer, with the audio portion delivered by telephone. Feel free to invite as many people as you want to your office or conference room for no additional charge. These webinars qualify you to earn your CPP, CISSP, CLSD, PHR, SPHR, CFE and CLE Credits. All Webinars begin at 2:00 p.m. Eastern Time and are one hour long. Register today! Celebrate the accomplishments of this year's WITI Hall of Fame Inductees at WITI's National Conference in San Jose, CA on June 8 & 9! Register to attend today. The Promise of Higher Standards. Bank of America is founded on an important idea: People are their best when they are striving to exceed accomplishments of the past. Our company has a long-standing commitment to redefining world-class business performance and standards of operational consistency, accuracy and efficiency. We have long insisted on continuous improvement and the sustained intensity that drives it, promising never to settle for an industry benchmark or our own historical performance. We have said our goal is nothing short of becoming the world's most admired company. This drive to excel can be summed up in two words: Higher Standards. This is our goal in everything we do. If you share our commitment to Higher Standards, Bank of America provides unmatched opportunities. Search for Bank of America jobs on WITI4Hire. For our Carmel, California Office to provide sparkling, innovative, creative and appropriate design solutions for major components or the entire level of a project through accurate interpretation of design specifications. To contribute to the conceptualization of designs and art approaches for major, complex programs; provide appealing layouts and designs to secure high quality art, and to prepare pages that fit design and production specs. A key responsibility will be to carry the major design impetus.